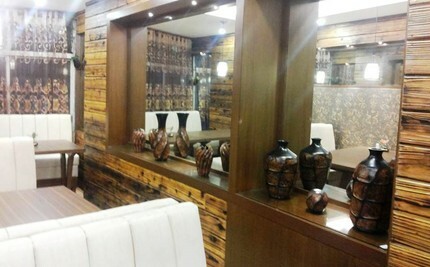 The restaurant is on Ladenla road and just before the Rink Mall (that houses Big Bazaar). A stairway leads down to the restaurant. Although the approach is quite unimpressive, once inside the atmosphere is quite charming and appealing, and it will be worth the effort to find it. They have renovated the interior of the restaurant in 2016. The restaurant has been operating since 1972. Years back when I first enquired about authentic Nepali food in Darjeeling, this was the restaurant pointed out by several of my friends without any hesitation. 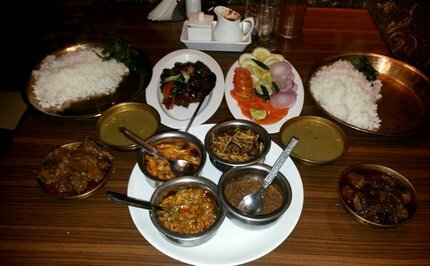 The restaurant continues to be one of the best in town when it comes to great Nepali thali (i.e. Nepali platter). Ask for Gorkha thali, or more precisely Gurkhey food. Other than steaming rice, vegetables and meet prepared in Nepali style, it will come with its own unique condiments. The walls of the restaurant are now all wood paneled with wall lights. It creates a nice overall ambience and gives an upscale look, but it is more like a budget restaurant or at the most mid-priced one. There is no view from this restaurant. The seats are of cushioned sofas with wood top tables. Owner himself is usually present in the restaurant and ensures that guests are properly serviced. So what to order here? As I said, they did and still do specialize in Nepali food which remains a locals favorite here. No wonder you will see lots of locals eating here including even monks. But Chinese dishes in my view are perhaps the best. If you love chili, order for chili chicken noodles which is my personal favorite. Otherwise even the normal chicken-egg fried rice and chili chicken are great as well. But note that their chili chicken is prepared with green chili and not green capsicum. Another great item here is the coriander fried rice... try it out if you haven't had anything like this before. Another great Asian item to order here is the pork chops .... excellent. In Tibetan food, momos are the most popular here, particularly the pork and chicken momos. They don't have vegetable momos. However I don't find these momos much different from what you get in few other restaurants. They are good nevertheless and worth a try. Accompany that with Thukpa (a light Tibetan soup). The overall service is good and friendly. You can see quick turn around time in the tables because of quick service. But another reason is people come here to eat good food and go. This is certainly not a restaurant where you would like to spend a lot of time beyond the food. Penang restaurant is located off Ladenla Road. Right opposite to the Rink Mall where Big Bazaar is prominently located, there is a narrow lane. Few steps into that lane you will find signs for Penang. The restaurant is located on a public stairway. It's about 5-6 minute walk from the Clubside taxi stand located next to the Gandhi road traffic police point.